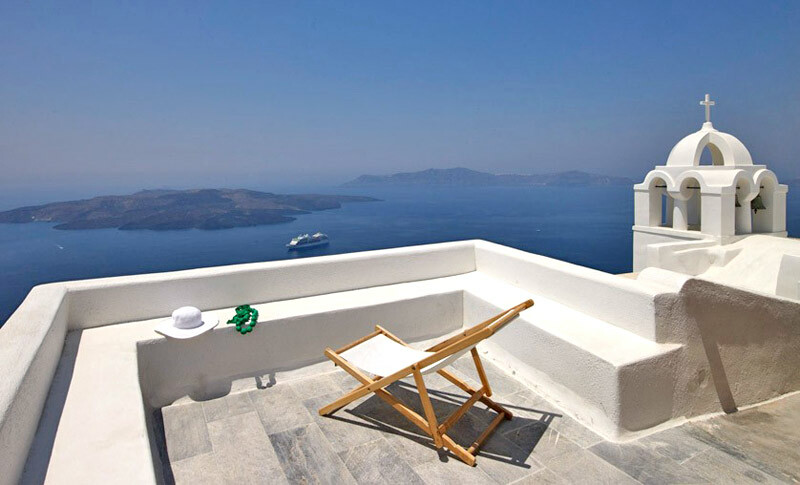 Aigialos Traditional Houses is located in a beautiful area in Fira, Santorini. It is traditionally built at the edge of the caldera so every guest can admire the wonderful view of the volcano and the crystal blue waters of the aegean sea. Aigialos Hotel is found in the Southwest area of the city centre, next to a beautiful Byzantine church of the 18th century and will offer you nothing but the best, from the houses to the service, and from the views to the facilities, Aigialos Traditional Houses is the place to be! Aeoleus (30 sq.m., 2 persons): It is situated on the northwest part of the hotel. It is a traditional cave house preserving the Cycladic architecture and decoration mixed with modern facilities. It includes a king size bed and a bathroom made of Greek marble. Skiron A (35 sq.m., 2 persons): Named after the Greek northwest wind (maistros), it is located next to an 18th century church devoted to Jesus Christ and it has been equipped with traditional antiques and furniture as well as a bathroom and a steam shower. It consists of a bedroom with one double bed (two mattresses) and limited view to the volcano. There is also a shared roof terrace, located next to the bell-tower of the church, with a great view to the volcano and the sunset. It can be combined with Skiron B for a larger accommodation area. Skiron B: (85 sq.m., 4 persons): Located next to the 18th century church as well, it is a traditionally decorated cave house composed of two bedroom with one king size bed and two sofa beds, two bathrooms and one terrace with an amazing volcano view. Notos (30 sq.m., 2 persons): Named after the Greek south wind, it has been decorated with both traditional and modern furniture. It consists of one room with a king size bed, a marble bathroom with a bathtub and a private balcony with a view to the volcano and the sunset. Sorokos (27 sq.m., 2 persons): Named after the Greek southeast balmy wind, it features modern decorations, consisting of one double bed room (two mattresses), a marble bathroom with shower and a shared terrace with a view to the sea. Levantes ( 62 sq.m., 4 persons): Named after the Greek east wind, it consists of two double rooms and two bathrooms as well as a balcony with a magnificent volcano and sea view. Pounentes (51 sq.m., 3 persons): Named after the Greek west wind, it is the most romantic Aigialos house. Composed of two storeys, it is decorated with both traditional and modern furniture. It features one king size and one single bed as well as one marble bathroom and a shared flower filled veranda, with a view to the volcano. Livas (62 sq.m., 4 persons): Named after the Greek southeast wind, it is a high ceiling house including a comfortable sitting and dining area, one double bed and two sofa beds, a marble bathroom and a flower filled veranda. Ostria (3 persons): Named after another term for the Greek south wind, it features a combination of traditional and modern decorations, including one double and two sofa beds, a Greek marble bathroom with a bathtub and a shared flower filled veranda with a volcano view. Evros (42 sq.m., 2 persons): This is the name of the ancient Greek southeast wind. Furnished with both traditional and modern pieces including a king size bed, this house features also a marble bathroom with a Roman bathtub and a balcony with a view to the volcano and the sunset. Maistros (43 sq.m., 3 persons): This is the term used for the northwest wind by sailors. The house features a king size and one sofa bed, one marble bathroom with bathtub and a balcony with a panoramic volcano and a sunset view. Kaikias (55 sq.m., 2 persons): Named after the ancient Greek northwest wind and furnished with modern and traditional pieces, it is a fully renovated house with a king size bed, a marble bathroom and a caldera view balcony. Zefyros (55 sq.m., 2 persons): Named after the ancient Greek west wind, it is a two-storey house traditionally furnished, including a king size-bedded room, a marble bathroom and a balcony with an outstanding volcano and sunset view. Apiliotis (55 sq.m., 4 persons): Named after the ancient Greek East wind. Traditionally furnished, it consists of a double bed room and a sitting area with one sofa and one single bed. There is also one bathroom and a balcony with an excellent volcano and sunset view. Voreas (55 sq.m., 5 persons): The is the name of the Greek north wind, which has been given th that large and elegant mansion located on the highest point of the hotel. It features a high ceiling living room with a sofa bed, two bedrooms with two king-size beds, two bathrooms and a private large terrace with an amazing view to the caldera. Tramountana (45 sq.m., 3 persons): This mansion is ideal for honeymooners as it offers absolute privacy and a romantic view to the sunset, the sea and the volcano. Equipped with both traditional and contemporary facilities, it offers one king sized and one sofa bed, a marble bathroom with a shower and a large private terrace.